This is one of the most spectacular classes at the show. 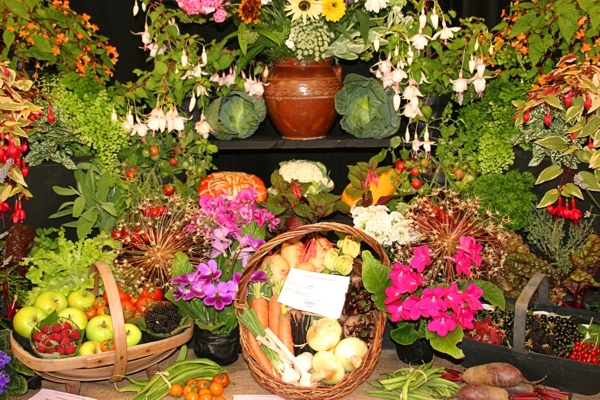 Members of groups such as garden clubs or groups of friends contribute together to create a display of cut flowers, pot plants, fruit and/or vegetables. Whilst the display will normally include all of these, it may be of one type only (e.g. just vegetables) or any combination of types (e.g. 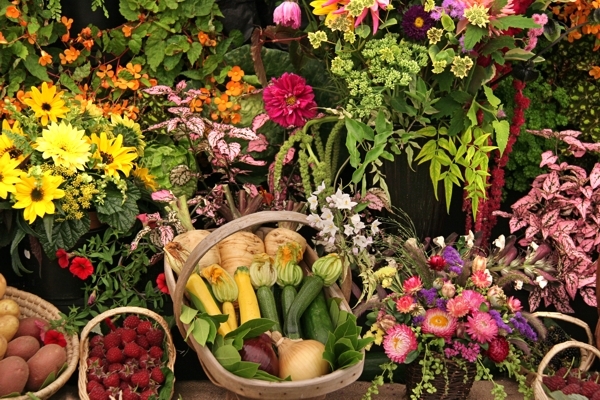 cut flowers and fruit). This is a great way for club members to work together on a team exhibit that can showcase the work and interest of the club. The space we make available is a table 1.8m long x 0.75m deep. It is against the side of the marquee so most clubs supply a back board to support exhibits and to make an impressive display. In our goal to encourage more clubs to enter this class, we are offering a first prize of £50 plus the Sampson Trophy. Second and third prizes are £25 and £10 respectively. As an added incentive, We also offer £25 expenses to every club that enters and we will also provide one free pair of show tickets for each entry. If you would like to know more about the class, would like a schedule sent to you or would like more details about the competitive classes at the show please contact Ian Coleby. Examples of past entries are shown below.